The only thing I hate more than buying fake flowers is buying ugly fake flowers. I look for better quality silk arrangements at yard sales and Goodwill. They don't last long exposed to the weather, no matter the price. The cost averages about $4 for all 4 seasons--or less than we used to pay for 1 gaudy Dollar General bouquet. I HATE the whole fake flower thing, too! 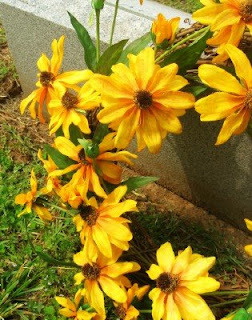 Both of my husband's parents are deceased, so he likes to take something to the cemetary, which I understand.....but I HATE spending money on something that is ugly and gets thrown away by the cemetary clean-up crew after just a few weeks. I think that this whole Memorial Day Holiday has gotten so commercial (just like most of our other holidays) that it has lost its signifigance as a time to remember both those who have given their lives in the service of our country, and of those we love who have died. Who says that the only way to remember people is with some ugly artificial boquet or wreath? I find it much, much more meaningful to either make something myself that we can take out to the cemetary, or to even gather some wildflowers to take with us. My husband's parents were farmers and, somehow, I think that's the most appropriate token of all. I guess you kind of have to go with the convention of the cemetary. One family headstone is in a section with nice flower displays, and it always looks a little forlorn if it's the only one without a bouquet. I have asked my husband (if he goes first) to get us plots in an older section. I like the quiet elegance of the old stones, myself. I also hate fake flowers unless they are really good fakes. Today my 11 yr. old and I were running errands in Annapolis. Yesterday was the Naval Academy graduation so it was finally "safe" to go in town since many of the families had left. We came home the route that takes us by the scenic overlook and the Maryland WW2 Memorial and my son asked if we could stop. The weather was beautiful, the flowers were blooming, he loves history so I figured "Why not!" We walked around the memorial and read about the sacrifices that were made by ALL Americans for that war. There is a separate memorial for the Marylanders that were killed at Pearl Harbor and in front of it had been placed a wreath of magnolia leaves. It had no ribbon. It was very simply done and yet was elegant at the same time. I thought that if I had a magnolia tree that is what I would like to make to put on my father's grave at the veteran's cemetary. Magnolia wreath! That sounds wonderful, plus it would stay green for a long time. I've been trying to figure out the same thing! Thanks for this timely discussion. My husband's brother died last December so reguarly visiting the cemetary is a new ritual for us. I really like the magnolia leaf idea, now where do I find some in Sacramento? And argh, why did I donate those fake evergreen wreaths, I could have decorated them for the holiday for the cemetary! I am a new blogger and would appreciate any feedback!